Are Kids' Sports Good for Preschoolers? Are Kids' Sports Suitable for Preschoolers? At What Age Should My Child Start Playing Sports? Is your child too young to play in a kid's sports league? This is a dilemma faced by millions of Americans across the country. What is the right age to get your children started in sports? Kids sports are a ritual played out in millions of households across the States every weekend. Mom, Dad, the kids and maybe a grandparent or an aunt or uncle or two, all pile into the minivan and head on over to the local sporting fields for a fun day of soccer, baseball or another kids' sport of choice. Played in hot or cold temperatures, sunny days or rainy ones, the commitment to the games by the participants (or at least their parents) rivals that of the U.S. Postal Service ("Neither snow, nor rain, nor heat..."). Filled with orange slices, sunscreen, water bottles, and folding chairs, for some parents, having their kids play organized sports is something they've looked forward to for ages. For others – well, not so much. Are Kids Sports Right For Your Child? Some kids' sports programs start enrolling children as young as age 2 or 3, while others have a minimum age of at least 5. In terms of team sports, soccer tends to be a little more accommodating to younger players, but there are lots of t-ball leagues designed especially for little kids. If you are considering an individual sport, swimming and gymnastics are great for preschoolers, as long as there is a low coach-participant ratio so your child doesn't get bored waiting his turn. The American Academy of Pediatrics suggests that team sports are more appropriate for children over the age of 6, while younger children might benefit from a sports class, citing a better ability to follow directions and a greater understanding of teamwork. How patient is your little one? Does she do well taking turns? Can she separate from you without having a meltdown? How does she react if things don't go her way? Does she play well with others? How is she at sharing? Lots of questions, but important things to consider. Playing a team sport involves taking turns, following rules, paying attention and sharing with (in some cases lots of) other children. While it's highly unlikely that your young child will be asked to memorize offensive and defensive plays, depending on the sport you choose, there will be some simple rules she'll have to follow – running in a certain direction, not touching the ball with her hands or wearing a helmet. When playing sports, kids are asked to perform – it may seem like a low-pressure environment if the score isn't kept and folks on the sidelines cheer for both teams, but for a little kid, all that attention could be daunting and scary. And if your child doesn't score a goal or get a hit, she may get upset. Has your child expressed a desire to play a sport on a team? If you ask him if he'd like to play, how does he react? Some young children may not realize that sports even exist, others are more aware of athletics thanks to an older sibling, friends or relatives. For the most part, sports programs for preschoolers are primarily about having fun. If it is a team sport, a score is usually not kept (although chances are you'll find a child that does) and the focus is on safety and a very loose interpretation of the rules (run in that direction). For individual sports, again, safety and the basic parameters of the sport of choice are covered. Whether team or individual, sports are a great way to encourage fitness in your preschooler. Not only that, but they help develop important skills – social and motor. On the field, your preschooler will start to learn what her body is capable of. They also learn persistence and determination. 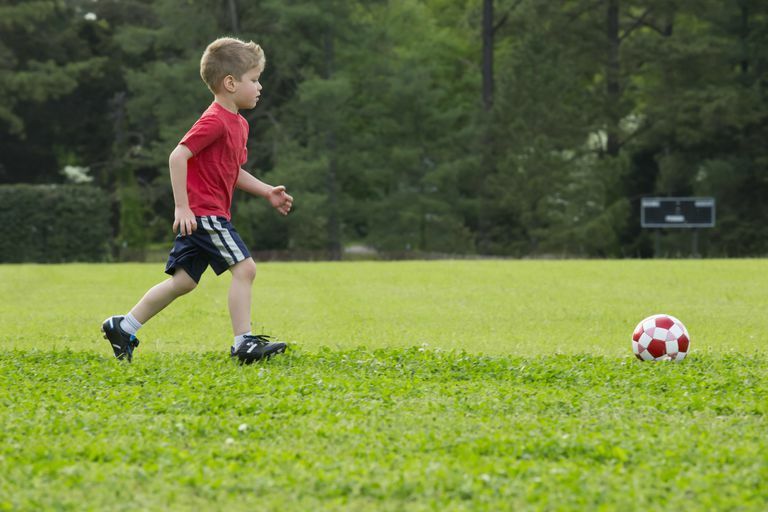 No matter what you decide, it's important to make sure that your child is active, whether it is through an organized sports program or just running around in the backyard or at the playground. An hour of exercise is the minimum – if it's cold outside, bundle them up tight if it's raining there are lots of indoor activities that are great for getting little kids moving. And if you have your heart set on your child playing a sport but she just isn't interested, don't throw in the towel just yet. As she gets older and more mature and confident in her physical abilities, chances are she'll be more enthusiastic about donning that jersey.